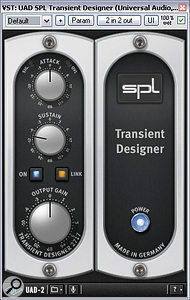 A wide, bright reverb on the main kick‑drum sample didn't sit well with the desired genre, so Mike used a variety of processes to make it less prominent: low‑pass filtering from Cockos ReaEQ; hit‑by‑hit audio editing; ‑9dB of Sustain from SPL's Transient Designer plug‑in; and mono summing courtesy of Voxengo MSED. This month's Mix Rescue track really caught my ear, with its combination of evocatively languid vocals and skeletal electronica backing — indeed, SOS reader Tom Marcovich's description of his track as 'Jeff Buckley meets Massive Attack' seemed pretty close to the mark to me. There were also a number of interesting production touches in the original mix: for example, the use of reverb and delay effects as ear candy rather than for more technical mix‑blending purposes, and some tempo changes and simulated edits in the song's middle section. Despite these positive attributes, Tom was still dissatisfied with the sound. Eliciting the opinions of some producer friends of his had garnered many encouraging comments with regard to the writing and performance, but there was also a general feeling that the low end of the mix was letting things down. 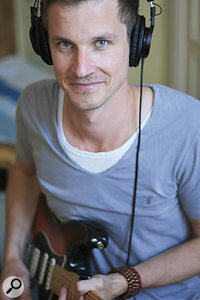 Unfortunately, the producers in question weren't able to give much in the way of specific advice in this regard, so Tom felt rather at sea with this aspect of the mix — especially because he was well aware that his room acoustics were compromising the sound of his respectable‑sounding Adam A5 monitors. This month's Mix Rescuee, Tom Marcovich.In addition to this low‑end issue, he felt that his production wasn't yet providing enough light and shade over the song's timeline, so wasn't properly supporting the song's development. He'd set his sights pretty high in this regard, with Massive Attack's classic Blue Lines and The Cure's recent 4:13 Dream providing touchpoints, and by the time he'd worked for more than a month on the song, he found that he just couldn't see the wood for the trees. It was at this point that he bounced down his latest mix in progress and sent it to SOS in frustration. 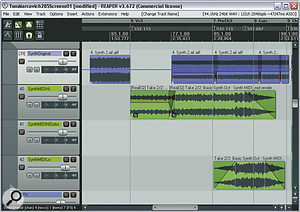 As usual, I asked Tom to send through his unprocessed multitrack files, and then loaded them into my own Cockos Reaper‑based DAW system to see if I could bring the production to a more satisfying conclusion for him. Here's how I tackled his main concerns. It might seem a bit counter‑intuitive when I say that dealing with the low end of the mix was mostly about finding the right space for the mid-range and high frequencies of the bass and kick drum, but that was the reality of the situation. In the case of the kick drum, the sample Tom had chosen had a very clicky, high‑frequency attack and a wide, bright stereo ambience, and as such reminded me more of something I'd associate with a heavy rock band than with anyone like Massive Attack. 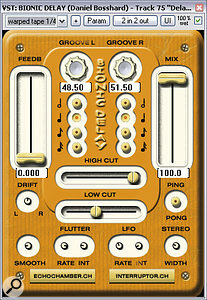 My initial approach was simply to roll off some of the high end (with a low‑pass filter at around 3kHz and a further 4dB peaking cut at 4.2kHz) to reduce the click and make the ambience tail less obvious, but by the time the frequency balance appeared more appropriate, the reverb still sat uncomfortably with the general stylistic ambitions — to my ears, at least! Getting rid of recorded‑in reverb can, in a lot of cases, be well‑nigh impossible, but with programmed drums there's a lot you can do without having to resort to sample replacement. I used the two most common tricks here. 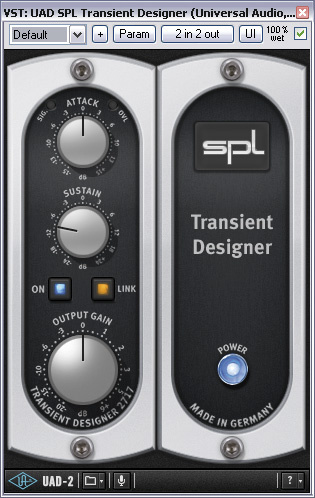 Firstly, I shortened the hit tails to reduce the apparent decay time of the reverb, partly by using per‑hit audio editing, and partly by applying an instance of SPL's software Transient Designer: pulling down the Sustain control on this type of threshold‑independent transient processor can be very effective at 'de‑reverbing'. 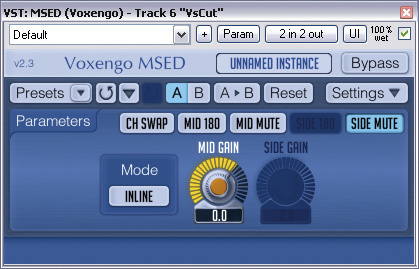 My second trick was to convert the track to mono, using Voxengo's MSED plug‑in. A lot of the audibility of many reverbs comes courtesy of their wide stereo spread, which pushes the reverb reflections into areas of the stereo field where they're less heavily masked by the direct sound. Put the reverb into mono, and the reverb is concealed much more easily behind the direct sound — and you may also get an extra helping hand from phase‑cancellation between the left and right channels if the ambience happens to have bad mono compatibility. The bass‑guitar part had a lot in common with the kick, in that its high end didn't really sound appropriate for the style — it was a guitar, rather than a synth, to start with, and also featured quite a lot of stringy higher frequencies, which drew too much attention away from the vocals. A gentle 4.5dB shelving cut at 1kHz gave a more understated tone for the majority of the track, although I later also added a low‑pass filter at 400Hz for the opening section, once I'd decided to give that a sparser arrangement. Bass guitar is one of the more dynamic instruments you typically meet at mixdown, so I compress it almost as a matter of course, especially where a consistently powerful low end is required. In this case, the performance warranted only a moderate 6‑8dB of gain‑reduction, for which I used Stillwell Audio's UREI 1176 model (The Rocket) and Universal Audio's Dbx 160 emulation (VCA VU). Why these particular plug‑ins? Well, each different compressor has certain subtle things it does to the signal alongside actually compressing it, and whether these make the signal sound better or worse is often largely a matter of luck, so with important or exposed tracks in a mix I usually like to try several compression options to see which offers my favourite subjective result. Those were just the two that seemed to sound most tonally flattering this time. This is the setting Mike used in Universal Audio's Precision Enhancer Hz to make the main bass‑guitar part more prominent on small speaker systems.That said, I had an extra reason to make a special bee‑line towards 1176 emulations, because that specific classic compressor is renowned for its swift gain‑reduction characteristics and I wanted to soften some over-enthusiastic picking transients using fast attack and release times. So fast is an 1176, in fact, that it can easily react to the individual waveforms of bass instruments, introducing distortion, so I still had to be careful with the time settings, eventually going for attack and release times of 1ms and 88ms respectively. This month's remix used a classic compressor combination for its lead vocals: fast limiting and FET distortion side‑effects from Universal Audio's modelled 1176LN, twinned with slower compression and valve distortion side‑effects from their modelled LA2A. 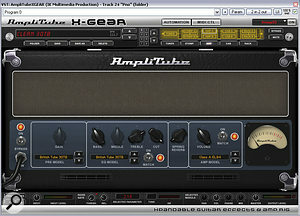 An instance of Universal Audio's Precision Enhancer Hz bass‑enhancer was the final insert plug‑in on the main bass‑guitar track, and served a very specific purpose: to match up the subjective bass levels for listeners on different playback systems. A lot of people either ignore bass enhancers because they don't know what they're for, or they just apply them in some kind of blanket way because they like the idea of their bass being 'enhanced', and neither attitude is likely to improve most mixes, so it's worth being clear about what these kinds of processors have to offer. Probably the best way to understand bass enhancers is to realise that they are capable of a couple of important things that EQ can't achieve: they can add frequency information to the bass instrument's spectrum, whereas EQ is only able to sculpt what's already there; and they can apply tonal changes more consistently to different note pitches, whereas EQ will affect the harmonic balance differently depending on how the note pitch interacts with the static EQ contour. 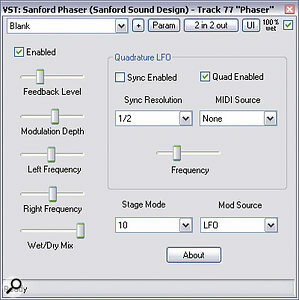 There are some bass enhancers (often called sub-harmonic synthesizers or sub‑bass enhancers) that add musically related frequency information below the bass note's original fundamental frequency, but in this particular bass line, the low‑end levels seemed fine, so this wasn't the type of processing I used. Other types of bass enhancer create additional harmonics above the frequency of the bass note's fundamental, improving the sense of bass weight on smaller playback systems that aren't capable of reproducing extreme low frequencies. 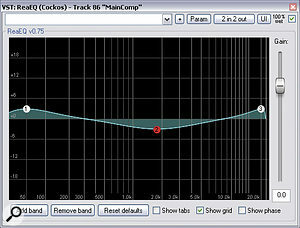 Precision Enhancer Hz is of this latter type, and it became clear that I needed its help when I experienced difficulties balancing the bass guitar on my different monitor systems: on my full‑range nearfields (Blue Sky's Pro Desk 2.1), the bass came across well, on account of its powerful low end; but on a smaller speaker such as my Avantone Mix Cube it lacked warmth. Equalisation wasn't much help here, because any mid-range boost I applied didn't really supply enough subjective 'warming' of the sound before the distorted frequency balance began to make the mix sound muddy. 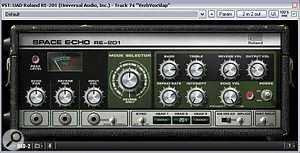 The lead vocal's main slapback delay was deliberately designed not to blend with the dry signal (by using a battered‑sounding patch from Universal Audio's RE201 Space Echo tape‑delay model in combination with a super‑short and wide early‑reflections patch from SSL's X‑Verb Duende plug‑in), in order to give an clearly audible impression of a special effect without distancing the vocal unduly from the listener. Setting up a bass enhancer isn't rocket science, once you grasp these basic principles. The first step is to find a warming effect that seems to suit the bass instrument on a subjective level, and for this remix that involved selecting the strongest of the available enhancement modes (with all the Mode lights illuminated) and then opening up the effect's high‑pass filter to its maximum 320Hz setting, to encourage lots of mid‑range harmonic density. The second step was then to adjust the level of the added harmonics, using the effect‑percentage control, until the apparent bass tone became more comparable on the different speaker systems. Further to these measures, the bass guitar required some further adjustments in response to the way the arrangement was put together. The simplest aspect of this was that I dipped out some 66Hz, because this frequency was dominating on some occasions where the bass guitar played together with the kick drum. The combination of the bass with the guitars (which come in at 1:26 and 3:20) was also a cause for concern, because the mid-range of the combined texture came across as a bit thin‑sounding. Boosting this area on the guitar parts just made things muddy, so I opted to thicken up those frequencies of the bass even more using a parallel distortion process: an instance of my favourite Mokafix NoAmp plug‑in bracketed into the 250Hz‑5kHz region using high‑pass and low‑pass filters. Although the bass-guitar sound is clearly distorted for these sections if you listen to the part in solo, it doesn't come across that way in the full mix — it just makes the bass/guitar sound appear fuller‑sounding. These same sections also benefited from letting more of the kick‑drum's click and ambient tail through, in order to unmask its high frequencies in the light of the fuller instrumentation. This was achieved by leaving the audio files unedited for those sections, bypassing the Voxengo MSED instance, and increasing the low‑pass filter frequency. 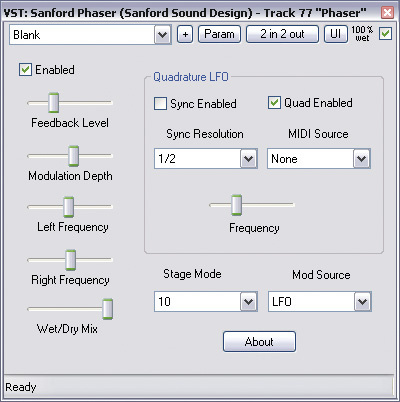 Just a few of the effects that were used to clearly differentiate the instruments from each other in this remix: Sandford Phaser, IK Multimedia X‑Gear, and The Interruptor Bionic Delay. Although the low end of the mix did require some work, this was comparatively easily managed. Much more time‑consuming was the task of adding arrangement variation, particularly because I was loath to just start throwing new sounds and musical parts at the job because of the risk of destroying the inherent character of Tom's original parts, which had been what drew my attention to the project in the first place. As you may know if you've read any of my previous Mix Rescue columns, one of my old faithful arrangement tweaks is to thin out earlier sections of the production in order to allow more scope for mix build‑up, and this certainly proved useful in this situation. However, because the song's instrumentation was already quite sparse, this did require that I push the boat out more than usual sonically in order to emphasise the unique character of each sound — the sparser the texture, the more each track can afford to reward close scrutiny. The lead vocal was clearly extremely important, so that received the most careful attention. 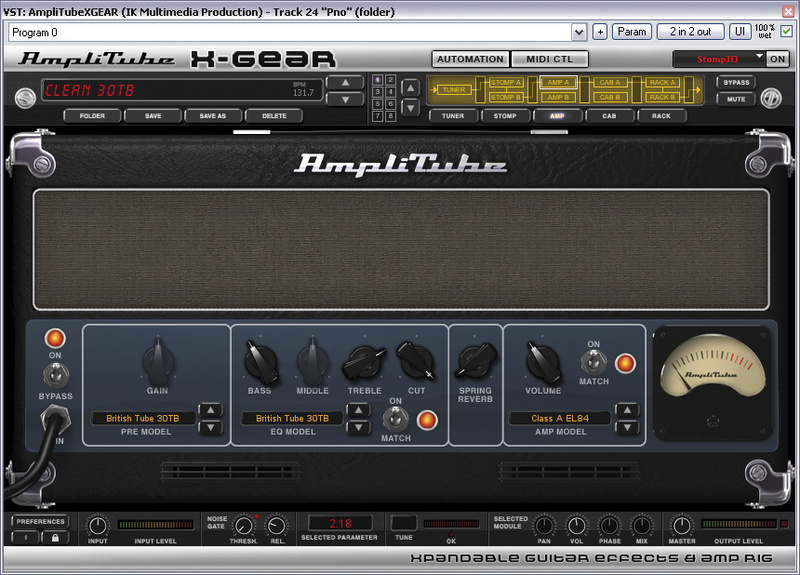 Much as with the bass guitar, I spent some time trying different analogue‑modelled 'character' plug‑ins in search of a more ear‑catching tone, and ended up with a chain of UAD2‑platform plug‑ins which seemed to work nicely: the Harrison 32C EQ, which is rapidly becoming one of my favourite EQ plug‑ins, and Universal Audio's own 1176 and LA2A plug‑ins. This particular dual‑compressor combination is one that often works well for maximising vocal detail, because the 1176 operates best for short‑term gain‑reduction, whereas the LA2A is better for overall level‑management. That setup also gives you a powerful double‑dose of distortion additives (FET distortion from the 1176 and valve distortion from the LA2A) which can frequently make vocals seem larger than life. As far as send effects were concerned, I decided to follow Tom's lead and go for a clearly audible treatment. However, I deliberately steered clear of using a more traditional reverb patch, as in the original mix, because that would have pushed the vocal too far back from the up‑front position that it seemed to demand. Instead I opted for a zero‑feedback slapback delay with a delay time long enough that it didn't merge significantly with the dry sound: the less a delay merges with the dry signal, the less it tends to blend it backwards into the mix. 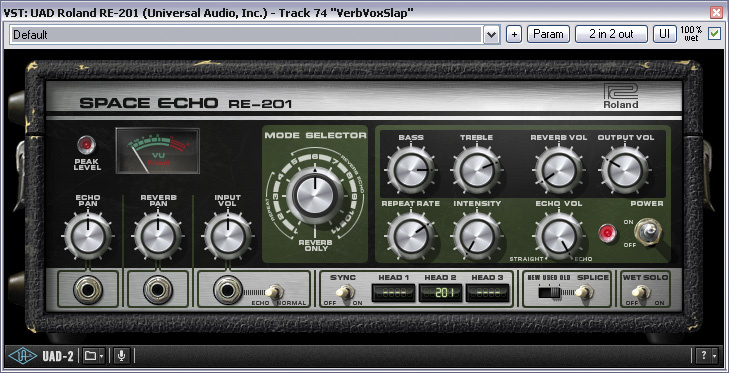 To reduce the danger of blend even further, I looked around for a suitably unnatural‑sounding delay, and finally chose Universal Audio's model of Roland's celebrated RE201 Space Echo, setting its virtual tape loop to its battered‑sounding Old mode. 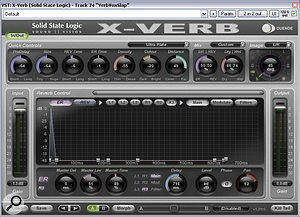 To this raw effect, I added a hint of stereo early reflections from SSL's X‑Verb plug‑in, to diffuse and widen the delay slightly, and an instance of Stillwell Audio's Vibe EQ to adjust the effect tone — removing some muddiness with 160Hz high‑pass filtering and 400Hz peaking cut, as well as bringing out a bit of hardness at 2.5kHz to improve the effect's audibility. The drums I consciously kept almost completely dry, to provide contrast with the effects used on other tracks (and, indeed, the room‑sound in the drum break that arrives at 0:43), but I did apply a little of one of my subtlest blending treatments to glue the samples together a fraction: a neutral‑sounding, 55ms, digital slapback delay, processed with transient reduction and high‑pass filtering to minimise its subjective audibility. The main electric piano received two different delay treatments. 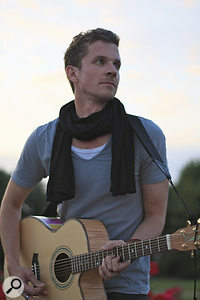 In the first section of the song, there was enough space to really go to town with the echoes, so I chained two different long‑feedback ping‑pong delay patches to swirl around the chilled‑out vocal performance. Where the drum break joined the fray, however, this delay felt like it was over‑egging the pudding, so I moved towards a simple tempo‑sync'ed echo at that point (based around The Interruptor's Bionic Delay) and panned it to the opposite side of the stereo image — still something of a statement, but one that covered a lot less mix real‑estate. Differentiating a second supporting electric piano part from the first was also a concern, so I took advantage of a Vox AC30 model within IK Multimedia's Amplitube 2 to add some fur to the first part, while spreading the second part across the spectrum with Sandford Phaser and treating it to a more unassuming tempo‑sync'ed feedback delay. By duplicating Tom's original Pad Synth part (blue track) on two further similar‑sounding soft synths (green tracks), Mike was able to introduce more light and shade during the middle section of the song.Because there was very little reverb so far, I made that more of a feature for the backing vocal parts, purposely choosing patches with an unusual sound to create separate contrasting environments in the mix. So for the entry at 1:11, I applied Reaper's no‑frills bundled ReaVerberate plug‑in, in conjunction with a 'tunnel‑echo' delay patch (ie. a high‑feedback 35ms delay) to swathe the voices in clangy metallic overtones, while the entries at 1:26 and 2:51 used liberal amounts of GSI's CPU‑light TimeVerb plug‑in in a pre‑compression insert configuration, which produced odd‑sounding gain‑pumping of the reverb tails. 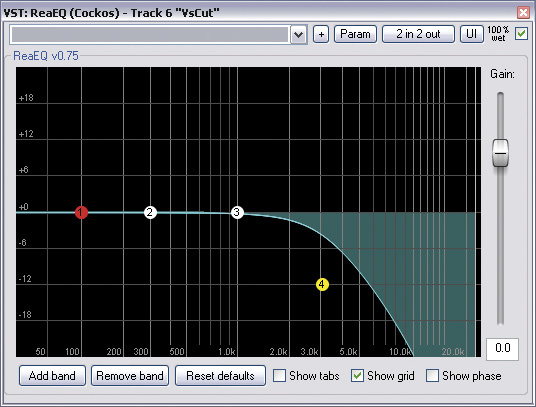 The corrective bus EQ setting Mike applied to his mix following his first real bout of mix referencing. Smile! Along with the aforementioned general thinning out of earlier sections of the song's arrangement, I also made a lot of arrangement adjustments to reduce the amount of repetition, especially in the rhythm parts. It's human nature to start ignoring any part that repeats more than a couple of times, so creating the odd variation and fill here and there is an easy way to make a limited number of musical parts appear more engaging over the span of a whole song. What's even better is if you can aim your variations for moments in the music where there are lulls in the interest of the lead parts. 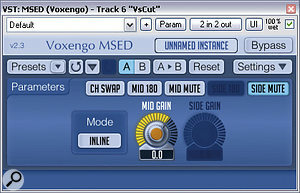 The first two eight‑bar sections of the remix provide a good example of this in the drum part. Although the instrumentation is very simple here (just a snare sample and a little muted electronic 'bup' sound), there was still room for me to add a little variation, in the form of an extra snare hit, during gaps in the vocal phrase after the two iterations of the 'that's fine' lyric. It's not a huge change, but it does provide a little bit of a bridg-over between the phrases. If you zoom out a bit you'll also notice that the second eight‑bar section is also not a simple copy of the first — it stops dead a bit early. Again, not a big deal to do, but quite effective, nonetheless, for nudging the listener's attention. Although this kind of editing allowed me to increase the variety of the arrangement significantly without adding any new musical parts (beyond a few atmospheric little background skitters from Sonic Couture's Tremors loop library), there were nonetheless a few tracks I added to fill out the overall sonics on occasion. 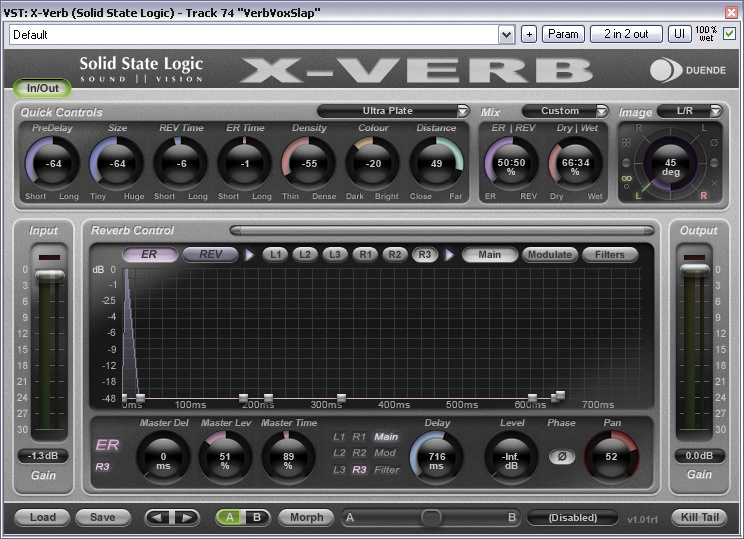 For example, I put in some eighth‑note electric guitar strums from Nine Volt Audio's Pop/Rock Guitars REX library to surreptitiously thicken Tom's own pair of guitar parts, and also layered in an extra snare‑drum sample to help the backbeat compete better with the guitars during those sections. In each case, though, the effect of the addition was quite subtle, because I processed the added parts to deliver quite specific enhancements: the guitars were aggressively high‑pass filtered at 1kHz, and had their transients softened with Stillwell Audio's Transient Monster to provide mainly high‑frequency sustain; and the snare sample was low‑pass filtered at 4.5kHz to highlight primarily its mid‑range decay tail. My final added parts were a couple of synth‑pad layers, which I used to assist Tom's own synth pad. The impetus behind adding these came from the fact that Tom's synth felt rather too detuned, and soured the overall harmonies of the song a bit much for me. 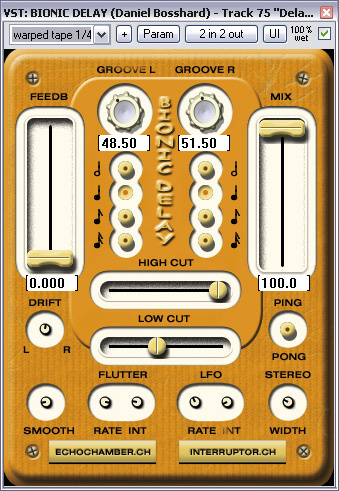 I high‑pass filtered the original pad at around 1kHz, just to keep some of its nice fizziness, and then snuck in Krakli Software's little freeware EZ Poly synth playing the same notes behind it with a bit more body. Once I'd started experimenting with adding layers to this synth pad, it occurred to me that it might provide another opportunity for arrangement variation, so in the end I also slowly faded in another warmer pad sound at 2:24 for the section just before the final chorus, which created a nice extra 'bloom' to the sound at that point. The difficulties that Tom had encountered in balancing the kick drum and bass guitar illustrate something of a truism about mixing: the root cause of bass‑instrument problems often has very little to do with the low frequencies. This is why having a small, bass‑light speaker on hand while mixing is handy, because it highlights when the mid-range and high end of a bass sound are in the right zone, without distracting you by flapping your trouser‑legs about. Another thing to draw from this month's remix is that a little musical material can go a long way in electronica styles. You don't need to have masses of different parts to involve the listener, as long as you take care to differentiate the available sounds clearly with your mix processing and effects, and then spend some time adding well‑targeted variations and fills. Thank Heaven For Bus EQ! Whenever I do a mix, I always make a point of checking my work in progress against any reference recordings mentioned by the client, as well as against my own favourite commercial mixes. However, I prefer not to get too involved in this 'mix referencing' process before I've got a full static balance with all effects in place, otherwise it's easy to lose sight of the unique demands of the production you're working on. It's also easy to end up spending a lot of time chasing your tail trying to adjust sounds and balances before they're in their final context. The down side of leaving referencing until you've all but finished the mix, though, is that you can sometimes set yourself up for an unwelcome surprise, as I did this month with Tom's mix. The human ear is fantastically adept at compensating for imbalances in the overall tonality of a mix, which means that even a seriously skewed frequency balance can begin to feel natural after a few seconds of getting used to it. Although I'd taken the sensible precaution of playing the odd commercial track during breaks in the mixing session, to try to keep my ears 'calibrated' to a suitable tonality, when I finally got around to properly A/B‑ing my first draft with some mix references (including a number of Massive Attack tracks) I discovered that the overall levels of the high- and low-frequency extremes were way out of line. Fortunately, this kind of thing isn't actually the end of the world, even if it does make you feel like a bit of an idiot! In my experience, as long as the balance works properly for you when your ears are adapted to the out‑of‑kilter mix tonality, you can usually rework the overall frequency contour of the mix with a single master‑bus EQ without upsetting the whole applecart. There might be a few things you have to adjust in light of the revised tonality, but it shouldn't be much if you only use very broad‑bandwidth EQ (gentle shelves and peaks with low Q values). In fact, if your mix appears to need more narrow‑band buss EQ to bring it into line with your references, it's usually a sign that the per‑channel mix processing needs more attention. 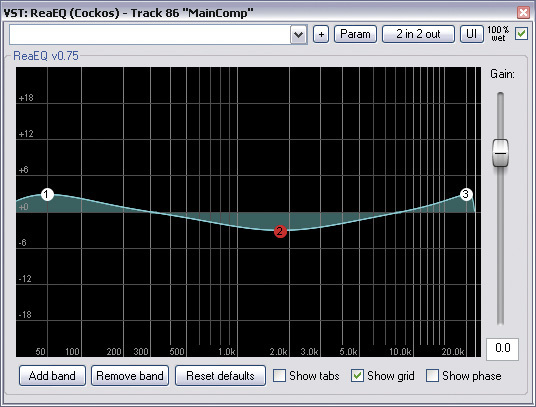 In this particular mix, I just applied a fairly standard 'smile curve' EQ (as you can see in the screenshot), slightly tweaked the bass and kick‑drum EQ gain settings, and the sound was soon back on course. We've placed a number of audio examples, including the full original and remixed versions of the track at /sos/apr11/articles/mixrescueaudio.htm, so that you can hear the differences for yourself. 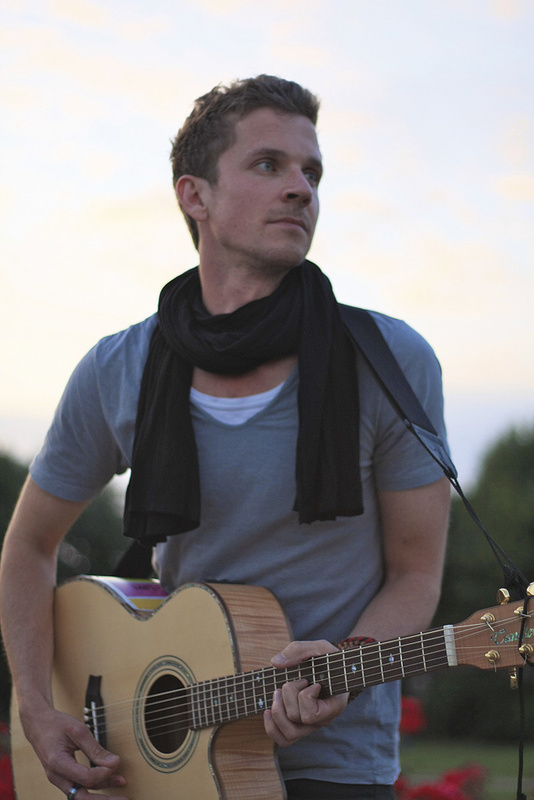 Tom Marcovich hails originally from Sydney, Australia, but has recently moved to London, where he is currently gigging solo and working on getting his own band together. This month's Mix Rescue song, 'That's Fine', is all his own work, and he recorded all the live instruments himself.